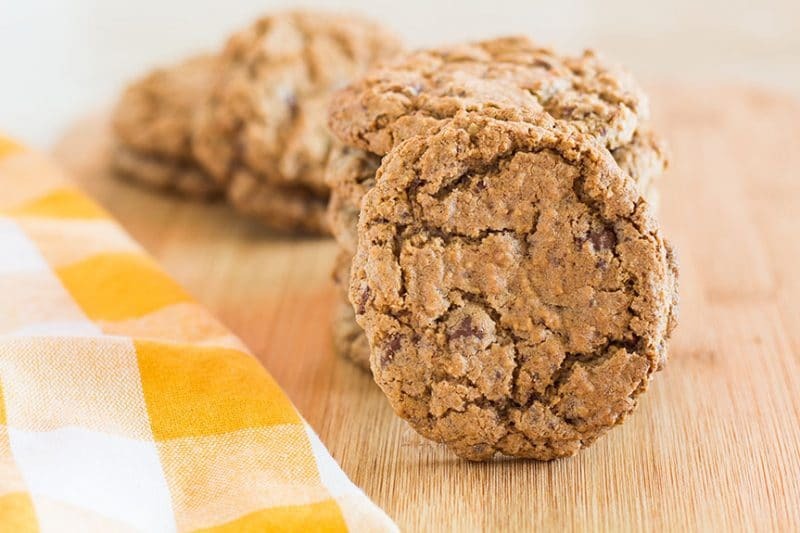 There are probably thousands of some variation of this Neiman Marcus Cookie recipe with ground oatmeal, ground chocolate, and chocolate chips running loose in the world. There are probably as many stories out there as to where this recipe even originated. I first ran across a version in Ann Hodgman’s Beat This! Cookbook back in the day when I collected cookbooks. I don’t believe this chocolate chip cookie recipe actually hails from Neiman Marcus, Mrs. Field’s, or anywhere else. I just know the urban legend that surrounds it. Regardless, this makes a great cookie. I usually serve these with hot chocolate New Year’s Eve, unless of course, I have made homemade cinnamon rolls. When you make it, do not leave them in the oven longer than stated in the recipe, or any other version of this recipe you find. It will turn into a moon rock. It will look like it is not cooked in the middle, but trust me on this – IT IS DONE. This cookie will also go stale FAST, so be prepared to eat them the day you make them or have room in the freezer to put them up before they have a chance to dry out. We find that nuking frozen ones in the microwave for about 15 to 30 seconds and served with hot chocolate or coffee is the best way to eat them. You can double this recipe since the original is double this version, but I would NOT try to double from there, this is a tough dough. I burned out the motor on my favorite professional series KitchenAid stand mixer years ago. Even back then, replacing it cost as much as a car payment! I had to wait until I received one for a Christmas gift. I have been very, very careful since then with how much of a burden I put on that motor. It has been my trusty sidekick for over 20 years now. Some of the cookie recipes call for milk chocolate to be ground up with the oats, some call for semi-sweet. 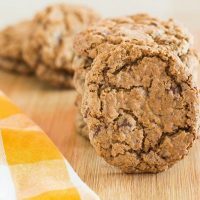 I have tried both ways and I prefer semi-sweet being ground with the oats, and half semi-sweet and half milk chocolate chips in these cookies. Unfortunately, grinding oats and chocolate fine enough for this recipe does require a food processor. Urban legend ties this chocolate chip cookie with ground oats to Neiman Marcus and Mrs. Field, not true but still delicious! Place rolled oats and semi-sweet chocolate chips in food processor and grind until it is like dust. 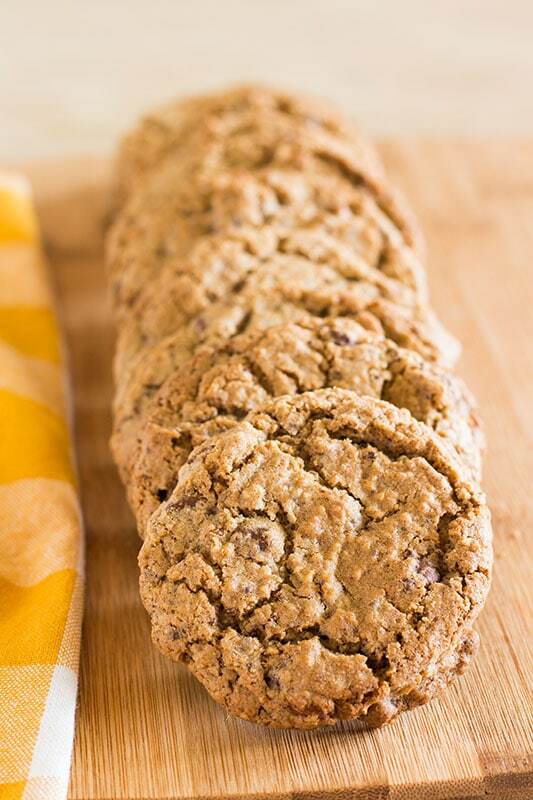 Mix chocolate oat mixture with flour, baking powder, and baking soda. Set aside. In a large bowl, mix together the butter and sugars. Beat until light and fluffy. Add eggs and vanilla. Mix well. Make sure to scrape down the sides and bottom of the bowl. Add the oat, chocolate, flour mixture. Start with a slow speed so the flour does not fly all over and mix just until flour mixture is incorporated. Add milk chocolate chips and mix just until chips are evenly distributed. If you have doubled the batch, you may have to do this step by hand. Prepare cookie sheets by lining with parchment paper or spraying with cooking spray. Roll about 2 tablespoons of dough into a ball and place on cookie sheet. Repeat with remaining dough, leaving about 2 inches between cookies. Place in preheated oven and cooked for 11 minutes. Do not over bake. They are supposed to be kind of wet in the cracks that formed on top of the cookies. After 11 minutes, remove from oven and allow to sit on cookie sheet for 2 minutes. Remove cookies from cookie sheets and place on a flat surface to finish cooling. I put foil or wax paper on the counter if I did not use parchment paper. If I used parchment, I slide the parchment paper off the cookie sheet and onto the counter. Once completely cooled, eat, give away, or get into the freezer.